You don’t need an altar to enjoy the cleansing powers of palo santo, or a calming essential oil, but you do need a vessel. And if, like us, your preferred aesthetic isn’t purple tie-dye circa 1995, finding a beautiful oil burner or incense holder can be quite a challenge (have a Google, trust us). But here, we’ve done the work for you, collating the dreamiest decor designed for your favourite rituals. Like this beauty from Addition Studio which although pricey, is possibly one of the most beautiful incense holders we’ve ever seen. The Neue Void incense holder is carved from solid Travertine (so weighs 1.5kg!) and even comes with its own palo santo. Melbourne potter Amy Leeworthy, redefines incense holders with her glazed ceramic ring, that could easily be pass as a piece of art. 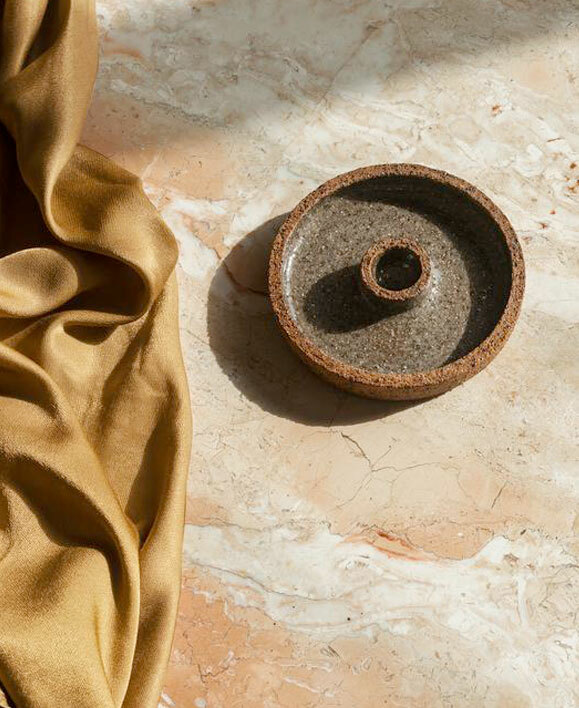 If minimalism is more your style, this polished brass dome from Bodha is simple and stashable if you like your surfaces fuss free. Adelaide potter Katia Carletti is known for her organic shapes (she uses a hand built pinching technique) and unique, yet functional pieces, so naturally she would have one of the best looking oil burners around. You can grab this beautiful two-piece oil burner from Natalie Marie Jewellery. This piece, designed for cone-shaped incense, is from the Brisbane-based Common Ceramics Stillness collection - which, as they say “explores the notion of incorporating quiet time into our tethered lives,” and we are here for it. Each pieces is designed to encourage reflection, ritual and mindfulness, which is pretty much the Wayward manifesto. As beautiful as it is functional, this Lukas Peet piece both holds your incense, and hides the ash, which falls into the hidden cavity. Genius. With Japanese simplicity and clean lines this handmade two piece oil burner from Melbourne outfit Wignut and Co is pretty much perfection. We challenge you to find a home - or style - it doesn’t suit. 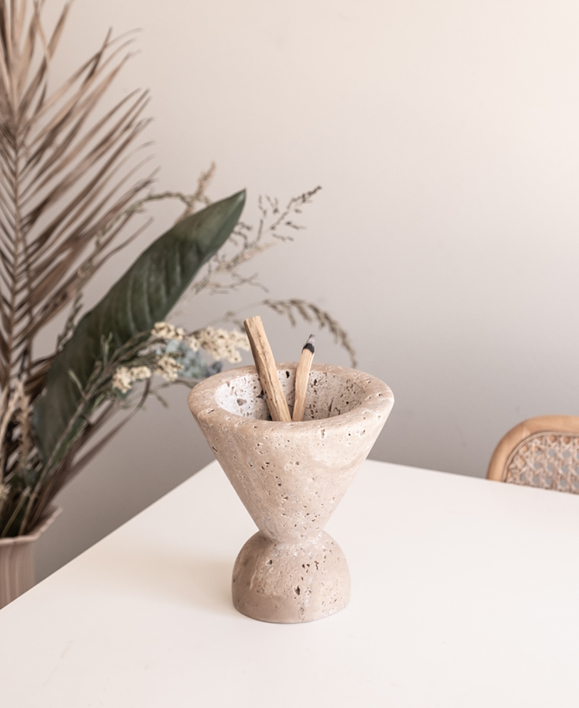 Another beauty from the Commons Ceramics team and their Stillness collection, this two piece stick incense holder has wabi-sabi vibes… which is exactly how we like our ceramics. This is an incense hut, where all the little cone shaped incense, palo santo and sage bundles live. Handmade in Californina, it even honours the full moon on its outer shell, so is ideal for your moon related rituals. But, more than that it’s just really pretty, and we can’t think of a better home for all of our favourite things.